Here we have one of T.S. Allen's rare outings that don't involve children. He was justly famous in his day for Just Kids and other series that feature rough-and-tumble young rapscallions. Seeing him draw adults, then, gives you a bit of a start. Mr. Softleigh concerns the travails of a fellow who can't say "no" -- presumably his name is a reference to him being a 'soft touch'. The formula is pretty simple, but Allen handles it well enough. 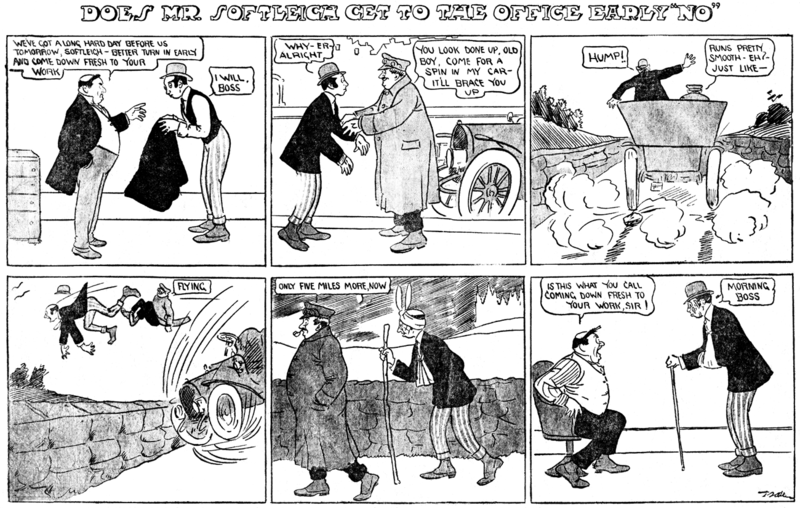 The series had a long run in the Philadelphia Press, from January 24 1909 to February 12 1911, but was also reused in McClure sections in 1909 (the Press and McClure seemed to have some sort of feature-sharing agreement).